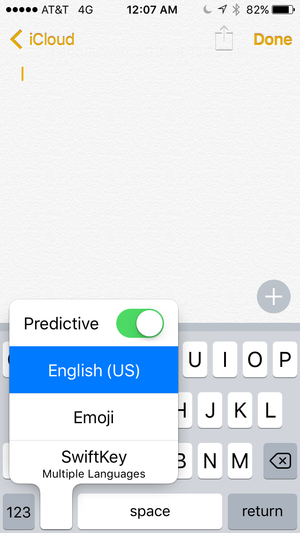 Are you still using iOS's built-in keyboard? It's easy to switch to a third-party keyboard that may better suit your needs. We'll show you how. Released in fall 2014, iOS 8 brought with it a truckload of new features—one of which was the ability to swap out Apple’s built-in keyboard with one of your choosing supplied by a third-party developer. After all, the stock keyboard isn’t for everyone, and it has its fair share of shortcomings. If you’ve never tried a new keyboard, now’s a good time to explore your options, and making the switch is a fairly easy process. Here’s how to go about it. Since third-party keyboards can access anything you type in, there are some privacy risks inherent to using such a piece of software. 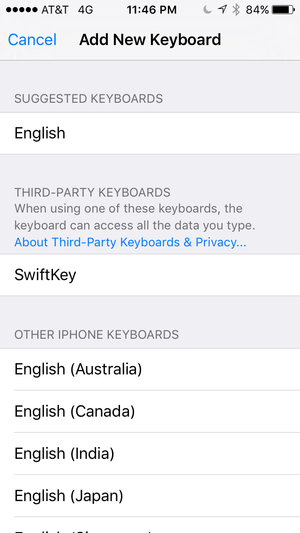 As Apple notes in a privacy disclaimer nestled in the Settings app, third-party keyboards may be able to send anything you type to that company’s servers. For example, a keyboard may need to communicate with a server in order to analyze what you type and offer up better autocorrect suggestions. Third-party keyboards may need to communicate with a server in order for certain features to work. You’ll need to explicitly grant such access to each keyboard you install. Fortunately, iOS has got your back. Keyboards don’t receive this level of access—which Apple refers to as “full access”—by default: You have to explicitly allow keyboards to submit any data it collects to a server. Also, you can easily switch between and remove third-party keyboards as you please, so you can change your mind later. iOS treats keyboards more or less as apps—you have to go through the App Store to purchase and download them. You have a number of options at your disposal. Swype ($1) is one popular option—it allows you to swipe your finger over letters in order to form words instead of punching a word out letter by letter. (Want to type “cat”? Place your finger on the C, swipe up to A, over to T, then release your finger). SwiftKey Keyboard (free) is worth checking out as well. From fun to practical, the App Store offers plenty of keyboards for you to try out. Developers have come up with all sorts of unique and novel keyboards that go beyond standard text input, though—see Oscar Raymundo’s slideshow from last August to get a taste of what awaits you. Also, check the Add Fun Keyboards page accessible through the App Store’s Utilities section (open the App Store, tap Categories, then tap Utilities). Once you download and install your new keyboard, you’ll have to tell iOS that you want to actually use it. 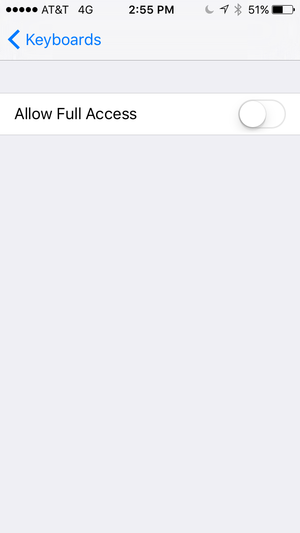 To start, open the Settings app, tap General, then tap Keyboard. Tap Keyboards—it’s the first item listed on the screen—then tap Add New Keyboard. Once you install a new keyboard, activating it is just a few taps away in the Settings app. You’ll find your new keyboard under the Third-Party Keyboards sub-heading, but before you proceed, you should tap About Third-Party Keyboards & Privacy to learn more about the aforementioned privacy implications of using a new keyboard. Now that you know what you’re getting into, tap Done, and on the following screen, tap the name of the keyboard you just downloaded. Just like that, your new keyboard will be added to the list of installed and active keyboards on your device. Tap your newly installed keyboard’s name to get at more options, including the aforementioned Full Access mode. At this point, you may want to hop into the keyboard app itself to see if there are any additional configuration options. 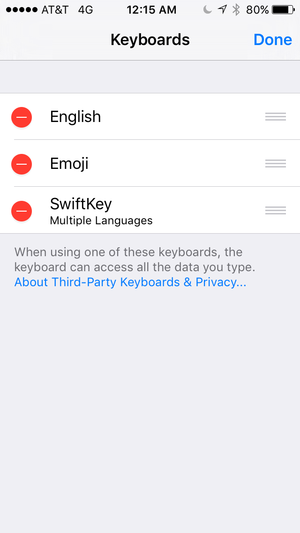 For instance, if you use SwiftKey, you can sign in to or create a SwiftKey account in order to get more features beyond the basic keyboard. The keyboard picker menu lets you quickly and easily switch between keyboards you have installed. Now that that’s all out of the way, it’s time to actually use your newly-installed keyboard. Open an app that accepts text input—like Notes—then bring up the keyboard. Tap and hold the Globe key until a keyboard picker menu pops up. Select the keyboard you just installed, then start typing. If you want to switch keyboards, you can do so at any time—just repeat this process and pick the keyboard you want to use. If you want to remove a keyboard from the keyboard picker menu, head back to Settings > General > Keyboard, then tap Keyboards. Tap the Edit button, then tap the red “minus sign” button. Tap Delete to confirm that you want to remove that keyboard from the keyboard picker. You can disable or re-enable any third-party keyboards you installed at any time. Note that doing so doesn’t actually delete the keyboard from your phone—you can always add it back to the list by tapping Add New Keyboard then picking the keyboard you want to use. You can remove the default keyboard from the list if you never want to see it again, and you can rearrange the order in which keyboards appear in the picker menu. Once you’re finished, tap Done. 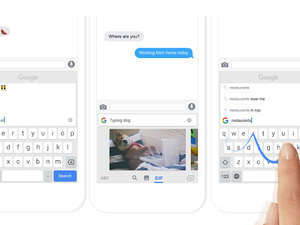 But what if you want to delete a third-party keyboard from your phone entirely? It’s simple: Find the keyboard’s icon on the home screen, then press it until the home screen icons start jiggling around (don’t press down too hard if you own an iPhone 6s or 6s Plus, though—you might invoke the 3D Touch feature instead). Tap the “x,” confirm you want to delete the keyboard app, then press the Home button. Do you have a favorite third-party keyboard? Let us know which one you use in the comments below.